There’s a side of Thoreau’s “Civil Disobedience” that I believe is often misunderstood – or maybe just misremembered. We remember his refusal to pay the Massachusetts poll tax, even at the cost of going to jail. But what is it that he hopes this act will accomplish, practically speaking? Perhaps that question seems misplaced. According to some readers of Thoreau – Hannah Arendt, for one – his refusal to pay the tax is divorced from any concern with practical consequences. He simply sees it incumbent on him, a dictate of conscience. “It is not a man’s duty,” he writes, “as a matter of course, to devote himself to the eradication of any, even the most enormous wrong; he may still properly have other concerns to engage him; but it is his duty, at least, to wash his hands of it, and if he gives it no thought longer, not to give it practically his support.” At most it is a matter of preserving his integrity intact, avoiding any personal guilt in the government’s wrongdoing. This is mistaken. The author of “Civil Disobedience” does very much aim for a definite, and immediate, practical result. Contrary to what Arendt and others have claimed, Thoreau isn’t merely acting in the interest of protecting his integrity. I don’t mean to deny that he feels morally bound to dissociate himself from a government that permitted and protected the holding of slaves, come what may. But it’s not for this alone that he feels morally bound to withhold his taxes. What makes the latter a duty for him is his hopeful belief that by doing so, he might prompt others, too, to dissociate from the government. If the tax-gatherer, or any other public officer, asks me, as one has done, ‘But what shall I do?’ my answer is, ‘If you really wish to do any thing, resign your office.’ When the subject has refused his allegiance, and the officer resigned his office, the revolution is accomplished. The citizen’s principled non-cooperation finds its completion in the official’s principled abdication: both must occur, to accomplish the revolution that Thoreau hopes his act might initiate. It might be a long shot, but there’s a real enough chance to make it one that’s worth taking. If we tend to neglect this part of Thoreau’s intention, perhaps it’s because we attribute too much importance to the financial aspect. We tend to assume that his point of withholding the tax is to refrain from making any monetary contribution to the furtherance of acts that he cannot in good conscience endorse. 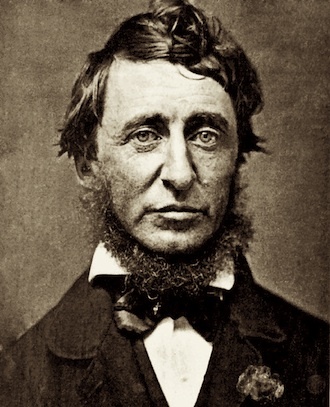 It has sometimes been said, pedantically, that Thoreau’s act was based on a misapprehension, in that the tax he refused to pay provided no revenue in support of slavery or the Mexican war. That’s irrelevant. Thoreau doesn’t care in the least about how the money gets spent. “I do not care to trace the course of my dollar, if I could, till it buys a man, or a musket to shoot one with, — the dollar is innocent, — but I am concerned to trace the effects of my allegiance.” (This is why it’s a matter of indifference to him, that his unpaid tax bill was eventually settled – without his involvement – by an unknown third party, probably his aunt.) His refusal to pay the tax is simply his way of denying the government’s legitimacy – and more to the point, his chance to challenge its agents’ putative authority. I meet this American government, or its representative the State government, directly, and face to face, once a year, no more, in the person of th tax-gatherer; this is the only mode in which a man situated as I am necessarily meets it, and then it says distinctly, Recognize me; and the simplest, most effectual, and in the present posture of affairs, the indispensable mode of treating it on this head, of expressing your little satisfaction with and love for it, is to deny it then. Thoreau’s hope comes through most clearly in a passage near the end of the essay, in which he raises – and answers – some hypothetical doubts about his position. I sometimes say to myself, When many millions of men, without heat, without ill-will, without personal feeling of any kind, demand of you a few shillings only, without the possibility, such is their constitution, of retracting or altering their present demand, and without the possibility on your side, of appeal to any other millions, why do you expose yourself to this overwhelming brute force? You do not resist cold and hunger, the winds and the waves, this obstinately; you quietly submit to a thousand similar necessities. “Why expose yourself to this overwhelming brute force?” His answer is not, that it’s better to suffer than sacrifice one’s integrity. Instead, his answer is to reject the premise, refusing the analogy. But just in proportion as I regard this as not wholly a brute force, but partly a human force, and consider that I have relations to those millions as to so many millions of men, and not of mere brutes or inanimate things, I see that appeal is possible, first and instantaneously, from them to the Maker of them, and secondly, from them to themselves… And, above all, there is this difference between resisting this and a purely brute or natural force, that I can resist this with some effect; but I cannot expect, like Orpheus to change the nature of the rocks and trees and beasts.